Included items: 3 Oranges, 6 Apples, 1 TJC Mango, 400grm of Dark Red Grapes, Pure Heaven Sparkling Celebration Drink (Red Grape) - 750ml and Cane Basket. 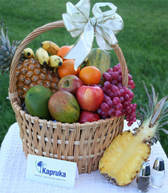 All kapruka fruit baskets are made with fresh fruits purchased from leading super markets in Sri Lanka. Included items: One Pineapple, 4 Oranges, 4 Apples, 1 TJC Mango , 400grm of Dark Red Grapes, MD Mixed Fruit Cordial, MD Mixed Fruit Jam, 24 Ferrero Rocher Chocolate Box and Cane Basket. This orchard-fresh fruit basket is a great treat to deliver any message, and is perfect for sharing with family and friends. A rich and ripe gourmet treat, it`s stylishly finished off with an elegant ribbon. Flower arrangement is made with Gerberas, Chrysanthemum, Astromania, White Maichale, Meemana and A glass vase. The perfect way to show your appreciation or wish someone a speedy recovery. The basket is finished with a bow for an elegant touch. Included fruits: One Papaya, One Pineapple, 3 Oranges, 3 Apples, 2 Green Apple, 1 TJC Mango, 400grm of Dark Red Grapes,Bananas 1.5Kg and Cane Basket. * Mangos are seasonal and may be replaced with another tropical fruit. 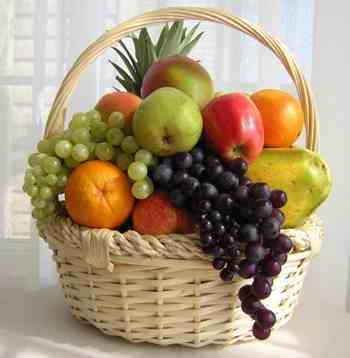 All fruit selection, overflowing in a gorgeous basket containing about 25 fruits. Included fruits: One Papaya, One Pineapple, 3 Oranges, 3 Green Apple, 1 TJC Mangos, 3 Apples,600grm of Dark Red Grapes, Bananas 1.5kg and Cane Basket. * Mangos are seasonal and may be replaced with another tropical fruit. 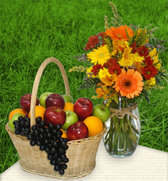 All fruit selection overflowing in a gorgeous basket containing about 30 fruits. The basket is finished with a bow for an elegant touch. Included fruits: One Papaya, One Pineapple, 4 Oranges, 3 Green Apple, 1 TJC Mangos, 3 Apples, 600grm of Dark Red Grapes,Bananas 1.5kg and Cane Basket. * Mangos are seasonal and may be replaced with another tropical fruit. Included Items: One Papaya, One Pineapple, 5 Oranges, 5 Green apple, 2 TJC Mangos, 600grm of Dark Red Grapes, Medium tin of Pringles Original Potato Crisp - 43g, Wood Apple Jam, Dilmah Premium Leaf Tea Bag - 200g and Cane Basket. * Mangos are seasonal and may be replaced with another tropical fruit. 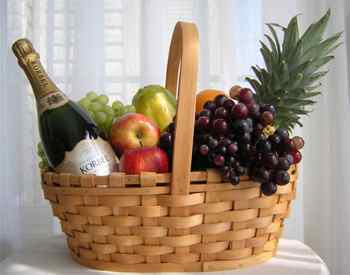 Celebrate in style with a basket of fresh fruit and Pure Heaven Red Wine. Included items: One Papaya, One Pineapple, 6 Oranges, 2 TJC Mangos, 6 Apples, 800grm of Dark Red Grapes, Pure Heaven Sparkling Celebration Drink (Red Grape) - 750ml and Cane Basket. * Mangos are seasonal and may be replaced with another tropical fruit. It`s the season of rambuttan again and surprise your loved ones by sending to their doorstep this basket consisting of fifty of the best mouth watering red rambuttans freshly picked from the trees in Malvana arranged in a cane basket giving that Sri Lankan look. 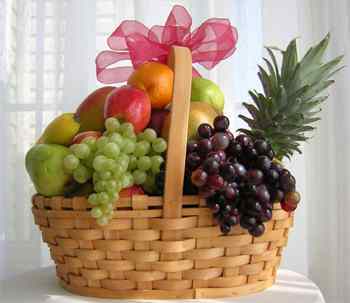 Make a perfect choice with this special Seasons Delight Fruit Basket enriched with nutritious fruits. You can send this to your loved ones to give a healthy experience. 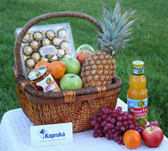 All kapruka fruit baskets are made with fresh fruits purchased from the producers in Sri Lanka. TJC Mango is the world`s biggest, juiciest mango! It is a beautiful golden orange fruit with an unblemished skin.It has excellent flavor, low fiber content and smooth flesh. The small seed means there is more flesh to eat. The average weight of a mango is 600g. 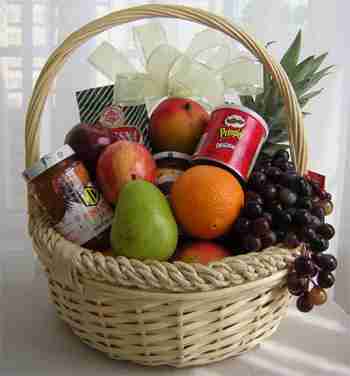 This Mango Basket is a perfect choice to send to your family and it is contains of 6 Mangoes. It`s the season of mangustin again and surprise your loved ones by sending to their doorstep this basket consisting of thirty best mouth watering mangustin. 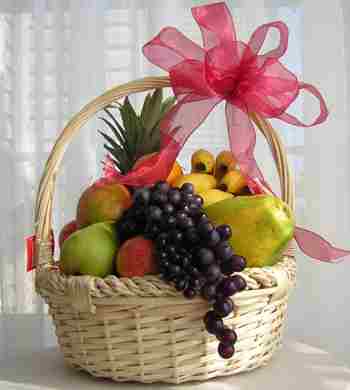 This fruit Basket contains 1 water Mellon,3 Avocado,1 pomegranate,3 Guava,2 Beli Fruit and 4 sweet oranges. All hand packed with care in a cane basket. This Tropical Fruit Basket must be ordered 48 hours prior to the delivery date. Unavailable seasonal fruits may be replaced with another tropical fruit. Typically sufficient for one week use for a family of 6.